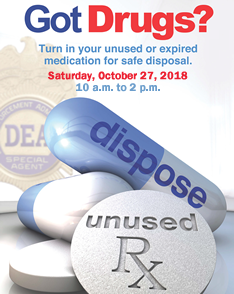 The Township of Randolph, in conjunction with the Morris County Prosecutor’s Office, will be participating in the National Prescription Drug Take Back Day on Saturday, October 27, 2018 from 10:00 a.m. to 2:00 p.m. Residents can anonymously and confidentially drop off unwanted or expired prescription medications, controlled substances and over the counter medications in front of the ACME at 690 Millbrook Avenue (on the corner of Sussex Turnpike). Doing so eliminates drugs that can fall into the wrong hands. If you are unable to make the date but would still like to get rid of unwanted medications, visit the Community Coalition for a Safe and Healthy Morris website for a list of permanent drop box locations.